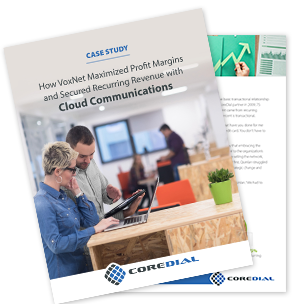 VoxNet, a managed voice and data provider based in Philadelphia, was seeing their customers increasingly move from on-premise solutions to cloud-based communications to increase reliability and scalability. They needed a cloud provider who could deliver unified communications (UC) to complement their existing premises-based services. Complete the form to download your copy of the case study. Learn how to successfully transition from a one-time sales model to a recurring revenue business model. Hear a real-case study of a CoreDial partner who went from being a premises-based interconnect company to a full-fledged managed service provider.